Availability: Enter the number of Runner Ducklings you would like in your assortment. We will include at least one black, blue, and white runner duckling. The runner duckling assortment contains at least one fawn and white runner duckling, one blue runner duckling, and one black runner duckling. Enter the quantity of runner ducklings you would like in your assortment, and we will send you a mixture of this wonderful breed! Runner ducklings are excellent foragers as they are a great backyard duck breed. There is a minimum of at least three for the runner duck assortment. 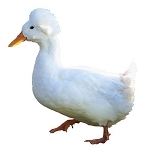 All Runner ducks were originally bred in Southeast Asia for high egg production and excellent mobility. There is evidence of their ancient ancestry from stone carvings in Java that are over 2000 years old. These ducks are still being used as they were then. Flocks of ducks are herded daily from field to field eating waste rice, weed seeds, insects, slugs and other bugs. They are then put in a bamboo pen at night where they lay their eggs and are released the following morning to clean other fields. During the course of their lives the ducks may cover hundreds of miles in their travels. Therefore, a hardy mobile duck is absolutely necessary - you will not find a better foraging duck than the Runner. As they are light in weight, there is also less chance of them trampling the vegetation in your garden or yard. Because of the high egg production of the native ducks, duck eggs are used in a variety of ways in Southeast Asia. Not only do runner ducks replace the typical chicken egg but duck eggs are made into two unique products, the balut (a partially incubated duck egg) and the salted egg (fresh eggs put in a salt solution or salt mud until the salt has permeated the entire egg). Due to the emphasis in coloration over the past 80 years in the breeding programs in England and the United States, the Indian Runner duck no longer excel at egg production. They are very average at this point. Why are they called Indian Runners? Tradition has it the ducks were first imported into England in the 1850s and were named Indians as the ship had proceeded from India and had traded with the "Indies". It wasn't until 1909 that the importing family acknowledged that they came from Southeast Asia - not India. But by then the name had stuck and the breed was extremely popular throughout the country. Until the Khaki Campbell was bred, Runners were by far the most productive egg laying ducks. Prior to the turn of the century there were many egg trials in England where representatives of different breeds and farmers were put on a common site and their egg production monitored and compared. The first Runners imported into England were either Fawn runner ducks, Fawn and white runner ducks, or White in color. The first records of them being in an exhibition were in 1877 at the Dumfries Show in England. In 1898 they were admitted into the American Standard Registry. 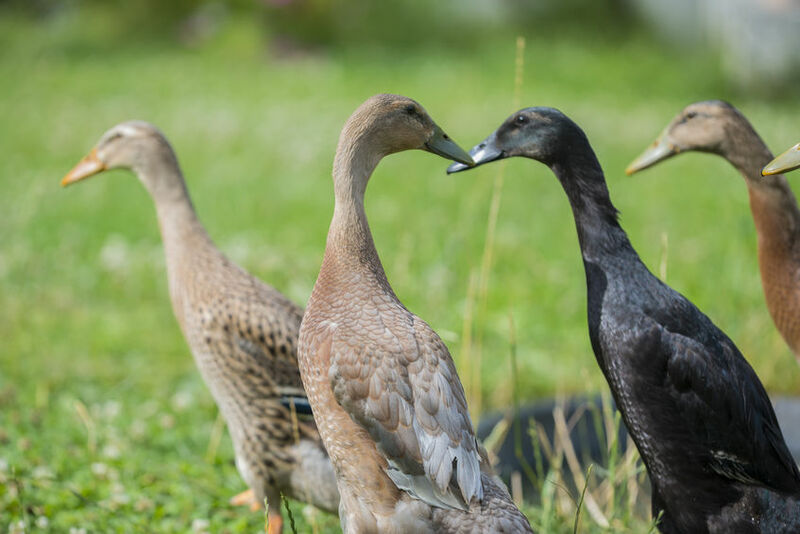 The Black, Blue and Chocolate runner ducks were not admitted until 1977.